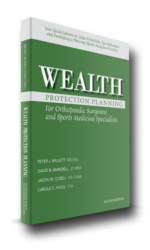 For Doctors Only demonstrates how to efficiently leverage a private medical practice and personal assets for greater long-term wealth, while also protecting it. More specifically, For Doctors Only helps educate doctors on strategies they may utilize to protect their personal and practice assets from lawsuits, taxes and bad investments while showing them how they may build wealth through the leverage of people, assets and effort. Many physicians throughout the U.S. have read this book and utilized the information to their benefit and the benefit of their practice.